Today was a pleasant easy ride accompanied with a very brisk cross wind out of the north at 40 mph. I feel like just copying all of the last 20 days of weather reports. Today, although kind of windy, was another gorgeous day of bright, clear blue skies with no rain. We are going to pay for this someday, probably when we hit the Midwest. The tri-motor did the entire ride. Little 8 year old Jennifer seems to be getting stronger and more into the ride each day. We were discussing that the tri-motor when fully loaded with passengers must weigh around 500 lbs. Wil has to be doing a lot of the heavy peddling on that bike. He has to be an incredible rider. It looks like the family is having a really fun experience now with one another and riding that bicycle. No news to report here. Everyone made it in good spirits. Mom, I couldn’t feel healthier. No need to worry today! Nothing really exciting in this category. I did get a late start today which allowed me to hook up with Mr. Tracey Bail of Goshen Indiana. We were able to ride side by side and chat for a long time up and down very pretty gently rolling hills and a very quiet road. The only traffic we observed were the sag wagons passing. Tracey turns out to be a father of four, his youngest is just graduating from high school next year. He’s been a boater and a bicycler, his wife doesn’t like cold winters. It sounded like we had a lot in common. He’s only on with us until Sioux Falls SD. I enjoyed his company and his nice steady riding pace. Eventually we had to get on to I-90 (yes the freeway again) and the pleasant chatting had to cease. Now the winds picked up, the traffic was tough and fairly close. There was not a big wide berm like we had experienced elsewhere. However, as the road twisted and turned we ended up peddling the last 10 miles or so with a very brisk tail wind that allowed most people to go 30+ mph on the flats for a long time. I was now having a good time since I am one of the bigger “sails” on the ride. I was able to pass the nice Miller family at a very brisk clip. Oldest son Mike rose to the occasion and chased me down fairly quickly. Number two son Derek got with the program slightly after that and chased both of us down. It turns out that Derek is a recent two time State of Florida mountain bike champion of some sort. I’ll have to get more details on that. However, if he and his brother didn’t stick so close to mom I am certain they could probably finish the entire ride before America by Bike set up their first sag stop. The guys are built as bikers and can really light it up. 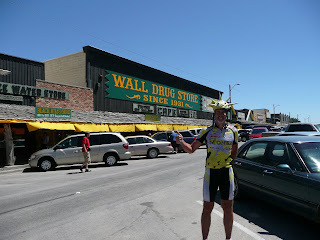 The ride ended at Wall Drug. This place is always a treat. After 23 days on the road we now get easily excited about anything that is a step above sage brush. If you haven’t been here you should make a trip out here. It is one store that is truly unique. The best description I can give you is a “Hillbilly Disneyland”. It’s a great testimony to American ingenuity and creativity. Max and I had fun taking lots of silly pictures there. Jennifer let me wear her helmet cover today. I walked through the big hallway in drug store with my bike and helmet on. The cover was a very big hit with lots of people there, especially the under age six crowd. Thanks Jennifer for letting me have fun with your fish! 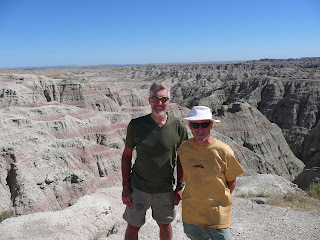 We were able to finagle a car and drive through the badlands for fun in the late afternoon. It really feels like you are on the moon. Whoa dad, I remember seeing these sights with you!! did you see the bull? the piano-playing chicken?? Ride on, Anto, ride on!